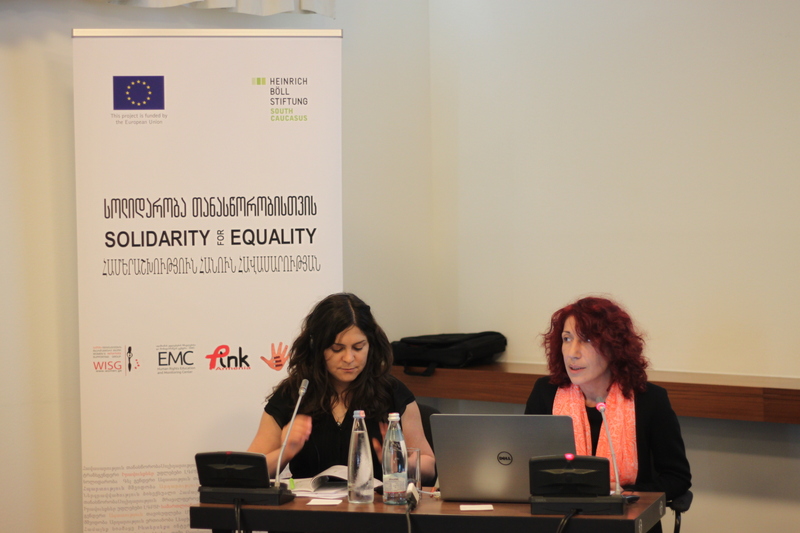 These were the encouraging words of one of the participants of the Regional Conference titled Solidarity for Equality: the Rights and Conditions for LGBTI Persons in Armenia and Georgia, which was organized on 2 June 2016 by the South Caucasus Regional Office of the Heinrich Boell Foundation in Tbilisi under the auspices of the EU-funded project Solidarity Network for LGBTI in Armenia and Georgia (2015-2017). Against the background of recently intensifying violence and hate speech on the basis of sexual orientation and gender identity (SOGI) in both countries, which precipitated following the International Day Against Homophobia Biphobia and Transphobia (IDAHOBiT) on May 17, including a large-scale World Family Congress which also took place in Tbilisi in mid-May, the Regional Conference served as a defiant reminder of the fact that LGBTI persons and allies continue to stand strong in their efforts to combat the widespread homo/bi/transphobia in the two South Caucasus countries. In addition to bringing together relevant state, non-state, and international actors to discuss LGBTI-specific issues, the Conference furnished a venue for the official presentations of two comprehensive research projects undertaken during the first year of the EU-funded action: a study of homo/bi/transphobic societal attitudes in Armenia and Georgia, unprecedented in its scope and scale; and an assessment of the legal and physical conditions of LGBTI persons in the two countries, accompanied by thematic, productive and interesting discussions on homo/bi/transphobia as a social issue and conditions for LGBTI persons in Armenia and Georgia. The Conference thus served as a platform for dialogue between the Armenian and Georgian sides concerning LGBTI human rights and freedoms, or lack thereof. It also presented an opportunity to compare and contrast the existing situation in both countries, bringing to light the asymmetry between Armenia and Georgia in terms of legislation (anti-discrimination and gender equality), and the level of engagement of authorities. Mr Stephen Stork, Deputy Head of Operations at the EU Delegation in Georgia, Ms Nino Lejava, Director of the South Caucasus Regional Office of the Heinrich Boell Foundation, Mr Ucha Nanuashvili, the Public Defender of Georgia, and Ms Sopho Japaridze, Assistant to the Prime Minister of Georgia on Human Rights and Gender Equality Issues lent opening remarks to the event. 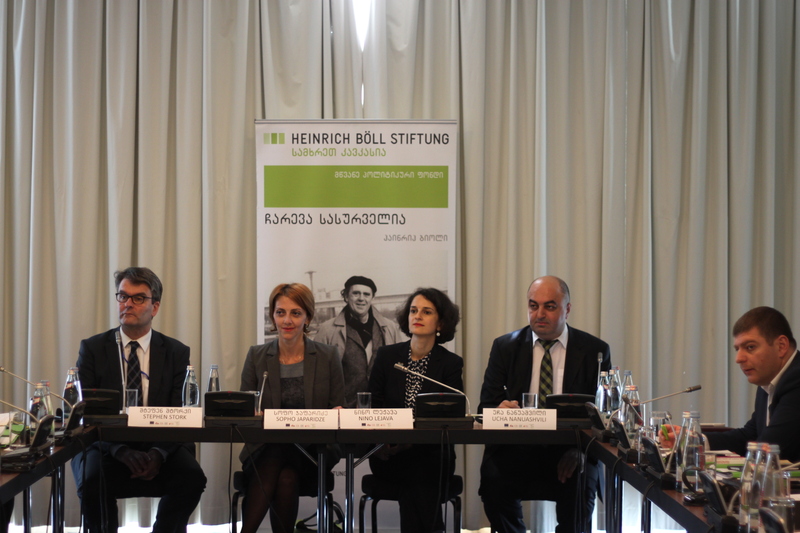 In her welcome speech, Ms Lejava highlighted the contributions of the Boell Foundation to the history of the LGBTI movement in Georgia, including the first public discussion on homo/bi/transphobia and LGBT rights held in the premises of the Foundation in 2005. She also gave an overview of the general political and social situation in the two countries. Mr Stork emphasized LGBTI human rights as one of the priority areas of EU policy in Georgia and elsewhere. Mr Nanuashvili proceeded to speak about current flaws in the Georgian anti-discrimination legislation, especially in terms of the absence of relevant enforcement mechanisms, issues and hurdles related to legal gender recognition for transgender persons, the situation of LGBTI persons in penitentiary institutions and other problems concerning SOGI-based discrimination in Georgia. Ms Japaridze then spoke about the positive changes in regulations and steps taken by the government to support LGBTI rights. She also presented details of the 2016-17 Human Rights Action Plan of the Government of Georgia including specific and targeted improvements in terms of LGBTI rights. After a brief presentation of the EU-funded action, the general current situation in terms of LGBTI rights and conditions in the country was presented by a prominent LGBTI activist and Executive Director of the NGO PINK Armenia, Mamikon Hovsepyan, who gave a detailed and oftentimes personal account of the discrimination and prejudice LGBTI persons and rights defenders face in Armenia on a daily basis. Eka Aghdgomelashvili of WISG and Nvard Margaryan of PINK Armenia proceeded to give comprehensive presentations focusing on the study of homo/bi/transphobic societal attitudes in Georgia and Armenia, which was, markedly, based on a shared methodology, which will allow for an in-depth comparison of the situation on the ground in the two countries in the future. As, unfortunately, expected, the studies revealed concerning and at times contradictory statistics, such as, for instance, in Georgia, most respondents who ranked human rights among the top five priority values, are opposed to rallies against homo/bi/transphobia, which essentially limits the community’s freedom of assembly and manifestation. This points to the fact that human rights in Georgia are still largely perceived as a privilege of particular groups. SOGI-related issues are not considered in terms of equal rights, but rather, in the context of “morality” and “tradition”. 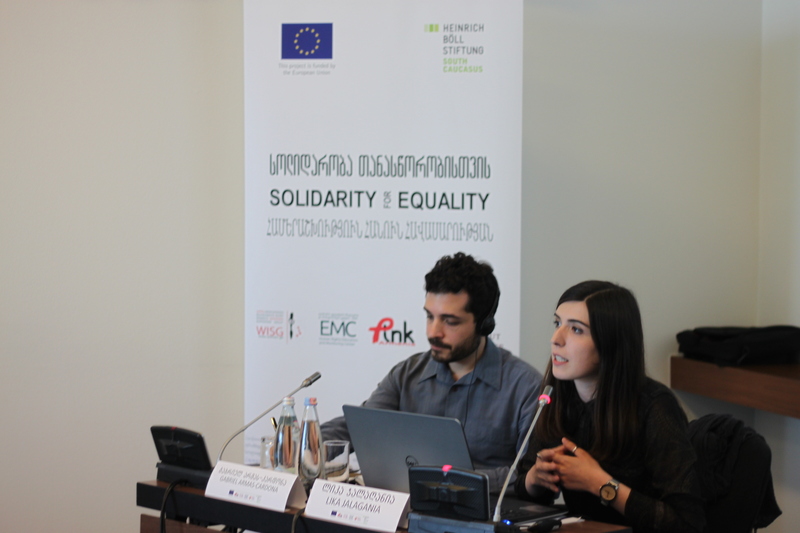 “If we attempt to assess the situation faced by LGBTI persons in Georgia in a unified context, we can assert that we do have the same rights as any other Georgian citizen, but enjoying these rights may cost us our lives,” says WISG's Eka Aghdgomelashvili, the author of the study. Whereas, in Armenia, where work is underway on a draft anti-discrimination law, 90% of study participants maintain that homosexuality and homosexual relations should be outlawed altogether. After a thorough discussion, the Conference was enriched by presentations from EMC’s Lika Jalagania and the SWV legal expert, Gabriel Armas-Cardona, on the legal situation of LGBTI persons in Georgia and Armenia, respectively, emphasizing such critical issues as legal gender recognition, bullying in educational institutions, discrimination in employment relations, and the special conditions for LGBTI persons in establishments such as the military and penitentiary. This segment, too, was followed by an in-depth discussion and a rewarding exchange between presenters and participants. Representatives of the Human Rights and Civil Integration Committee of the Georgian Parliament, a number of parliamentary parties, the Prosecutor’s Office of Georgia, the Gender Equality Department of the Public Defender’s Office, the Human Rights Defender’s Office of Armenia, the Georgian Public Broadcaster, numerous diplomatic missions and international organisations, as well as relevant Armenian and Georgian non-governmental and civil society organisations, including those working on LGBTI issues, were among those attending and participating in the event. Both the study of homo/bi/transphobic attitudes and the situational assessment of legal conditions of LGBTI persons in Armenia and Georgia will serve as a basis for country-specific, evidence-based, long-term advocacy documents of strategic significance, as well as relevant recommendations, aimed at overcoming homo/bi/transphobia in the two South Caucasus countries, which will be a monumental step forward for LGBTI human rights in the region. To view and/or download electronic versions of the study reports, please, click here. The principal objectives of the EU-funded action implemented by the Heinrich Boell Foundation South Caucasus Regional Office are combating discrimination against LGBTI persons, enhancing their protection from all types of violence, adequate provision of their human rights, and supporting their full-fledged inclusion into Georgian and Armenian societies. Together with its partners, the project seeks to overcome homophobia/transphobia through consistent public awareness raising, positive media visibility, civil society mobilisation and the promotion of the human rights movement and agenda. 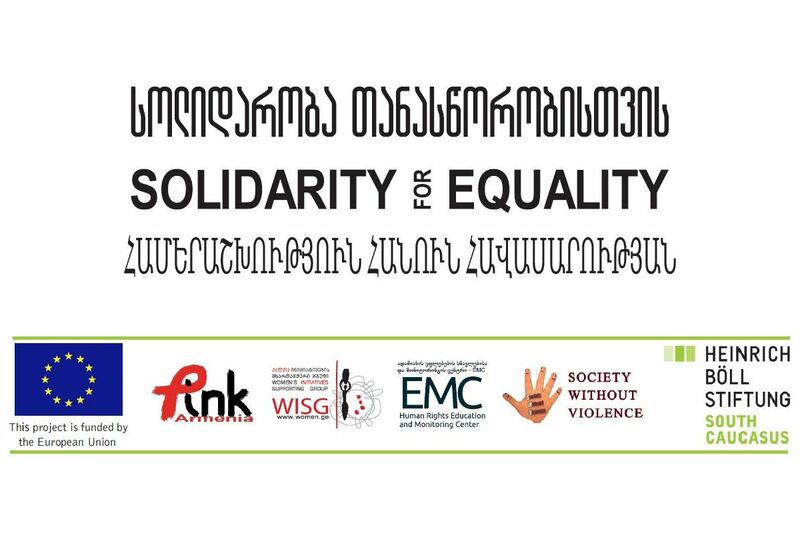 The partners of the action are: Women’s Initiatives Supporting Group (WISG), Human Rights Education and Monitoring Center (EMC) in Georgia and Society Without Violence (SWV) and Public Information and Need of Knowledge (PINK) in Armenia. The contents of this publication are the sole responsibility of the South Caucasus Regional Office of the Heinrich Boell Foundation and can in no way be taken to reflect the views of the European Union.